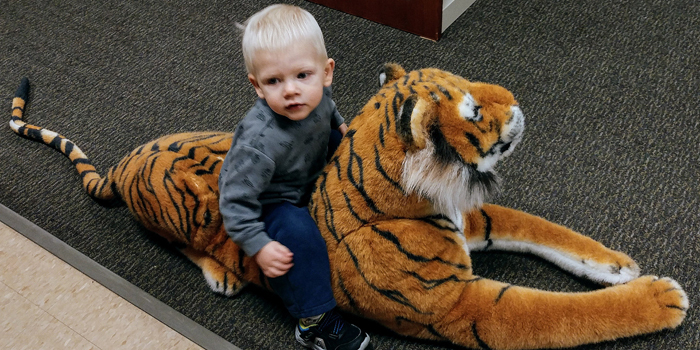 Gabriel King romps with the resident tiger at North Webster Community Public Library during a recent visit to the Youth Department. NORTH WEBSTER — It will be a busy Monday, Dec. 17, in the Adult Services Department at North Webster Community Public Library. The day starts off at 10 a.m. with Writer’s Corner, when the group meets to share the compositions they have written about their experiences being bitten. The essays can be real-life experiences, humorous or imaginative. Participants are given a topic or subject matter to write about each month, and then gather on the third Monday to share and discuss what they have written. You don’t have to be an accomplished writer to join in, just someone who enjoys writing. Due to the Christmas holiday, Voyager Book Club will meet on a different day and time at 1 p.m. Monday, Dec. 17. In this book club, each participant reads a book of their choice within an assigned genre. At Monday’s meeting, the group will be sharing and discussing holiday books. In January, the genre will be books written by Debbie Macomber. Normally meeting the fourth Tuesday each month, Revolving Recipe Round-Up will also meet Monday, Dec. 17 due also to the Christmas holiday. Everyone is asked to prepare a dish served with sauce and bring it to share and sample at 5:30 p.m. Bring the recipe, too, to exchange with others. If you enjoy cooking and trying new foods and recipes, Revolving Recipe Round-Up is a fun way to build your recipe file, make new friends and enjoy an evening of food and fellowship. The library provides the table service and coffee. The video re-enactments from the 2018 North Webster Cemetery Walk held last September are posted on the library’s website and available for online viewing. There you can hear the stories of those featured in the Cemetery Walk as told by the enactors who portrayed them. If you were unable to attend September’s event or simply want to re-visit, go to nweb.lib.in.us and click on 2018 Cemetery Walk Videos link. Videos from past years are available for viewing as well on the Local History and Genealogy page of the website. The library will close early at 5 p.m. on Thursday, Dec. 20.